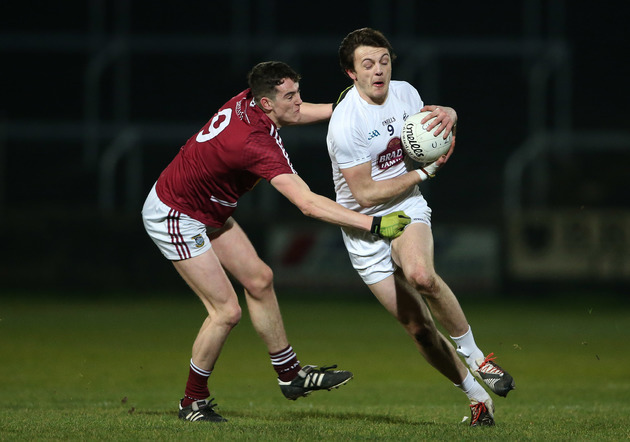 Kildare’s star burned brightest as the light faded in the second half of a good work-out against Roscommon in St.Conleth’s Park tonight, although they were flattered by Rossie’s profligacy as they ran out seven point winners. A missed penalty 15 minutes from time by Diarmuid Murtagh would have levelled affairs and the Connacht men shot 16 wides to Kildare’s 11 in a game played at a good pace. The match programme listed eleven unavailable Kildare players and captain Eoin Doyle was added to that list before throw-in with Johnny Byrne taking over the centre-back slot. The starting 15 was back-boned by Athy with no less than 5 players from the south county club lining up including both Hyland brothers. Unfortunately one of their number, Kevin Feely, had a disappointing night. The newly-appointed vice-captain temporarily left the fray between the 7th and 11th minutes and whatever the niggle was it forced him permanently out of the game 10 minutes before half-time. The elder Hyland meanwhile was dismissed on a black card in the second-half having played superbly up to then. In Feely’s absence his club-mate and midfield partner Pascal Connell had to take on extra responsibility and the rookie gave an industrious performance against a strong Roscommon midfield while scoring the second-half goal that ultimately proved crucial for the home side. Kildare were quick off the mark and opened up the Roscommon defence straight from the throw-in for David Slattery to shoot a point within just 14 seconds. It wasn’t a sign of what was to come however, at least not in the short-term. Both teams were sluggish to start with – the Westerners shooting four wides in the opening six minutes – their only score in the opening 15 minutes coming from a Murtagh free. Kildare didn’t do much better although Fergal Conway scored a fine long range point on 14 minutes to edge the Lilywhites ahead 0-2 to 0-1. Murtagh got Roscommon off the mark from play before Feely restored Kildare’s advantage with a free. Clearly he was still on point for placed balls despite the return of Neil Flynn to the starting line-up after his appendix operation. That said, youngster Paddy Woodgate was given the opportunity to take a right-hand side free but wasn’t successful. The Raheens made looked bright in the opening period but struggled to get on good ball. After half an hour there were still only five scores on the board but the game finally ignited in the five minutes leading up to the break. Fintan Clegg found himself with space on the edge of the area and drove a shot wide of Mark Donnellan’s outstretched arms to raise Roscommon’s green flag and put them in front for the first time. A minute later Conor Devaney put Roscommon three points clear. Tommy Moolick hit back with a shot from the left wing and Flynn converted a free having taken over duties from the departed Feely. But Clegg’s injury time point put the visitors ahead 1-4 to 0-5 at the break. Roscommon boss Kevin McStay had the luxury of 15 named subs and seven of those entered the fray at the break to add to two first half changes. The Rossies also made a tactical switch of jerseys, ditching the first half blue for the more luminous yellow as the light faded worryingly. Kildare in their Persil whites had no such issues. Cian O’Neill sent the experienced Eamon Callaghan and Ollie Lyons into the fray at half-time and both were influential, the Naas man scoring two points and bringing some accurate passing to bear on proceedings. Flynn grew into the game in the third quarter and he was quickly off the mark with two frees to level proceedings at 1-4 to 0-7 before swapping points with impressive Roscommon sub Donie Smith. The Westerners should have found the net again though when Shane Killoran blazed wide with the goal at his mercy. Indeed Roscommon’s penetration of Kildare’s half-back line in the second-half was concerning and unfortunately a recurring theme again this season. Kildare’s own attacking was improving though with Flynn, Callaghan and Niall Kelly prominent. Their goal came in the 45th minute and was just reward for Connell’s hard work all night. Woodgate had a shot off the upright and Kildare recycled the ball through a few hands before Connell gained possession on the edge of the box and only had goal on his mind. A fierce low shot did the job. A minute later Woodgate got himself off the mark in some style with a brilliant left footed point from near the left hand sideline. Cregg bore down on goal again for the away team on 52 minutes but Peter Kelly was on hand to get a hand on his effort and concede a ’45. Smith and Kevin Higgins had points for Roscommon after a Callaghan effort for the home side but the game’s pivotal moment came in the 55th minute. Donnellan and Kelly were deemed to have clumsily fouled full forward Cathal Compton in the area but Murtagh spurned the chance when blasting the spot kick wide to the right. Roscommon seemed to lose heart at that stage and Kildare finished strongly. Cian O’Donoghue was a welcome returnee for Kildare and he grabbed a point. Kildare then rattled over five more points in the last 10 minutes (Flynn, Woodgate, Connell, Kelly and Callaghan) to Roscommon’s one (Smith). Illuminating? Probably not. But good to put the League Final behind them at least. Kildare: Mark Donnellan; Peter Kelly, David Hyland, Mark Hyland; Shea Ryan, Johnny Byrne, Emmet Bolton; Kevin Feely (0-1, f), Pascal Connell (1-1); Fergal Conway 0-1, Niall Kelly 0-1, Con Kavanagh; Paddy Woodgate (0-2, 1f), David Slattery (0-1), Neil Flynn (0-5, 5f). Subs Used: Fergal Lennon, Ciaran Cafferkey, Kevin Higgins (0-1), Donie Smith (0-3, 1f), Shane Killoran, Gary Patterson, Darren O’Malley, Thomas Featherstone.